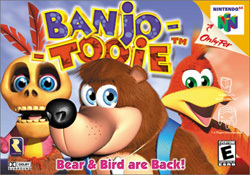 Banjo-Tooie, the sequel to Banjo-Kazooie, will be released on Xbox Live Arcade this April. Like the BK XBLA port, BT‘s graphics will be updated: 1080p and a smooth frame rate. I seem to recall BT having a pretty rough frame rate back on the N64, so this is more than merely a new coat of paint. There’s no exact date beyond April, I’m afraid. Or, in English, Rare could be planning some good ol’ fashioned downloadable content for us.